A man stands near the sea in Carita, Indonesia, Wednesday, Dec. 26, 2018. Indonesian authorities asked people to avoid the coast in areas where a tsunami killed hundreds of people last weekend in a fresh warning issued on the anniversary of the catastrophic 2004 Asian earthquake and tsunami. Indonesian authorities urged people to avoid the coast in areas where a tsunami killed at least 430 people over the weekend in a fresh warning issued on the anniversary of the catastrophic 2004 Asian earthquake and tsunami. Indonesia's Meteorology, Geophysics and Climatology Agency asked people late Tuesday to stay at least 500 meters (1,640 feet) and up to 1 kilometer (less than a mile) from the coastline along the strait, which lies between the two islands. "All these conditions could potentially cause landslides at the cliffs of the crater into the sea, and we fear that that could trigger a tsunami," Karnawati said at a news conference. She asked that communities remain vigilant and not to panic. It was a sharp contrast to the disaster that struck 14 years ago off the northwestern tip of Sumatra island. An enormous magnitude 9.1 earthquake rocked the area the morning after Christmas, creating gigantic waves that surged far inland and swallowed everything in their path. The wall of water killed some 230,000 people in a dozen countries, more than half in Indonesia's Aceh province. The devastation was vast, and the disaster was among the worst in recent history. Saturday's event, coupled with an earthquake and tsunami in September on Indonesia's Sulawesi island that killed at least 2,100 people, triggered flashbacks for some who survived the 2004 tragedy. "When it happens, I always remember what we have been through," said Qurnaty, 54, who lost her home and several family members to the 2004 waves in the hard-hit provincial capital of Banda Aceh. Qurnaty, who like many Indonesians uses only one name, prayed with surviving family members at a mass grave there on Wednesday's anniversary. "Every time I see them (on TV), I feel really, really sad. All we can do from here is to pray for them," she said. Though recovery was slow, some victims of the latest tsunami said they remember the resilience of the Acehnese people, which gives them hope that they too can rebuild their homes and their lives. "I am scared. I am traumatized by the tsunami that I only knew before from the news," said Kusmiati, who also uses one name. "Now I know how horrifying a tsunami is." Her face was still bruised and her legs swollen after she and her husband managed to survive being hit and dragged under by the waves after fleeing a beach villa in Carita, where they were working. Beaches were largely empty in the area, which is typically crammed with tourists, and police patrolled on motorbikes, warning people to stay away from the coast. Some residents defied the warning, returning to what was left of their homes to begin cleaning up as heavy rain fell and waves pounded the shore. "I am still afraid that the tsunami will return, so when dark comes, I stay at a temporary shelter on the hill," said Rohayati, who worked to salvage what was left of her battered house, 300 meters (985 feet) from the sea. "I hope the government can provide a tsunami warning, like a siren, for people living in coastal areas so we can be alerted of a potential tsunami and have time to save ourselves." The country's system of tsunami detection buoys — deployed after the 2004 disaster — has not worked since 2012, with some units being stolen or vandalized. Karnawati, of the meteorology agency, said that because the tsunami was caused by volcanic activity, it would not have been picked up by the system's seafloor sensors, which monitor movement from conventional earthquakes responsible for most of Indonesia's tsunamis. Residents of Sumur village, which has been slow to receive aid due to roads being cut off, remained stunned by how quickly the tsunami hit. The beach, located just a few kilometers (miles) from the tourist island of Umang near Java's western tip, is popular for snorkeling and other water activities. The tsunami decimated the area, ripping houses from their foundations and bulldozing concrete buildings. 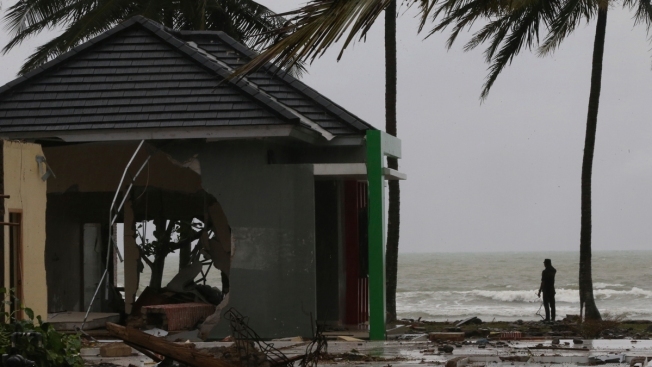 Scientists have said the waves were recorded in several places at about 1 meter (3.3 feet) high, but Sumur residents insisted they towered more than 3 meters (10 feet), possibly as high as 5 meters (16 feet), which Sutopo also confirmed in some areas. More than 21,000 people have been displaced from their homes and heavy equipment is urgently needed in the Sumur subdistrict near Ujung Kulon National Park to help get aid flowing and reach people who may be injured or trapped, said Nugroho. Anak Krakatau formed in the early 20th century near the site of the cataclysmic 1883 eruption of Krakatoa, which killed more than 30,000 people. It has been erupting since June and did so again 24 minutes before the tsunami, according to the geophysics agency.